Also being there for family and friends is a big part of it, to explain “medically”what is happening as the body is preparing to go home, or a as shoulder to lend support. That we did above and beyond..to ensure every detail from “dying wishes” to the needs and comfort of those left behind is treated with respect, love,dignity and integrity. There are many faces of death, (not just a literal/physical death) which we all encounter at some particular point or another as we are walking our path. Particularly when we lose a loved one. We can come face to face with it on a daily basis: Denial, Anger, Grieving, Acceptance, Releasing, and letting go. This Circle will be held on March the 1st 2014. Julia Inglis and Tony Esta are wife and husband creators of Sacred Familiar. Over the last 8 years as Sacred Familiar, they have run retreats, shamanic journeying circles, ancestral dreaming workshops, oracle and meditation classes around Australia. Julia is an artist, storyteller, dream worker and teacher of women's mysteries. She is passionate about bringing back our memory of ancestral wisdom through engagement in the dreamworlds and the shamanic arts. Born into a family of readers, seers and healers, Julia began reading and divining for others from the age of 13. Julia is carrying on the tradition of her Irish and Scottish ancestors, particularly her grandmothers who through visions and dreams passed the Ancestral wisdom of Swan Medicine. Tony's passion is for creating sacred and protective spaces for ceremony and for harmonious living. As a shamanic practitioner, Tony is often walking between the worlds - something he has experienced since the age of 3 after the first of 2 near death experiences. From this age onwards, Tony began to experience seeing people and animals in spirit. Born into a family of Greek descent, it was only much later in life that he discovered that these gifts of communication with the spirit world were Ancestral Medicine passed through the matriarchal bloodline. Nearing the end of 2011, through a series of visions and dreams, Julia received teachings from her ancestors to create Swan Blessing, a shamanic ceremony to release past beliefs, vows, oaths and sacred contracts binding access to Ancestral Medicine. In the blessing Julia and Tony hold space for others to self-initiate back into their Wise Medicine without fear of persecution. Over the last 2 years Julia and Tony have journeyed around Australia with Swan Blessing to assist in the removal of binding ties of the past including memories carried in the blood lineage through family histories. They are passionate about healing the Soul Loss that occurs from memory of persecution, vows of poverty, silence and obedience and past promises to remain hidden. When we begin to understand and respect our own ancestral medicine, we can honour and learn from the wisdom of other indigenous cultures. Indigenous leaders, we believe are the teachers of the future. By releasing the promises and beliefs of the past, we can be active participants and advocates for change for Mother Earth and can find new expression for our Ancestral Medicine as fearless healers, wise teachers and innovative artists. Sacred Familiar is dedicated to seeing the rise and return of the People of Medicine again. Our teacher is Mother Earth, we follow no religion, no dogma. We encourage you to trust the wisdom of your spirit and open your hearts to the beauty of nature. This Space is dedicated to Healing from grief and loss. In a way it’s also dedicated to acceptance of the soul’s journey. Death is very individualised and there is no handbook on how to handle death of a loved one, or on facing death yourself. We all accept/face Death in our own way. We don't claim to have all the answers. We come from a place of remembering : A collective of The Wild innate wisdom inherent in all of us . However in saying that: Based on our combined experience,Practical advice and wisdom .We may make it a little easier or less scarier for the road and journey that we all eventually embark on. 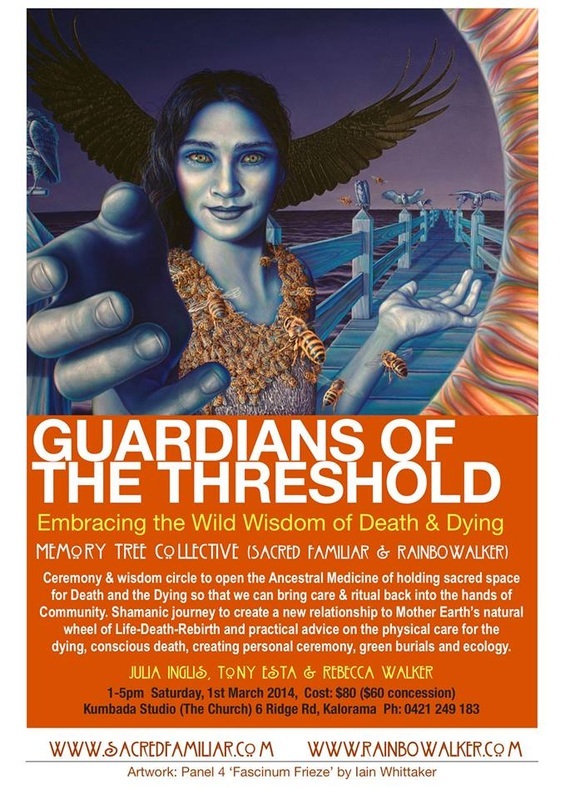 Julia: Past life facilitator’s : Unbindings / dealing with the death of self and rebirth.